Stock rebuild 330 bottom end, stock style link bar timing chain, stock cam, upgraded pushrods/springs (done by previous owner), less than 10 hours run time most under 2k rpm. I had a timing cover leak, so I pulled it off and went ahead and bought a basic cast cam gear Cloyes double roller timing set to replace the stock one. Once apart I noticed more slack than I would like in the timing chain that was installed, and after pulling the gears off I noticed some pretty significant wear on the cam gear teeth, especially with so little run time and tiny cam. My best guess is a cheap/soft gear that maybe missed heat treat? Anybody seen something like this before? Last edited by sailtexas186548; 02-06-2019 at 09:21 PM. most people advance cam two degrees to make up for the slack in timing chain..
my engine builder also has drilled a .020 hole in the plugs behind the top gear. It doesn't look like that chain fits the cam gear very well ?? could be the pic tho. Griff, Knot 4 Me and VoodooRob like this. I have holes drilled in the oil galley plugs. You make a good point that the chain and gear may be mismatched, glad I had to pull it down otherwise this would have gone unnoticed until it was much worse. I will check the chain and gear compatibly out of the engine when I get a chance. I have a Cloyes billet cam and crank gear coming with a true double roller chain, and a Torrington bearing for the cam gear. That chain was so loose that it was on the verge of jumping a tooth or two or more. I would say that you saved your engine. Did you assemble the engine? 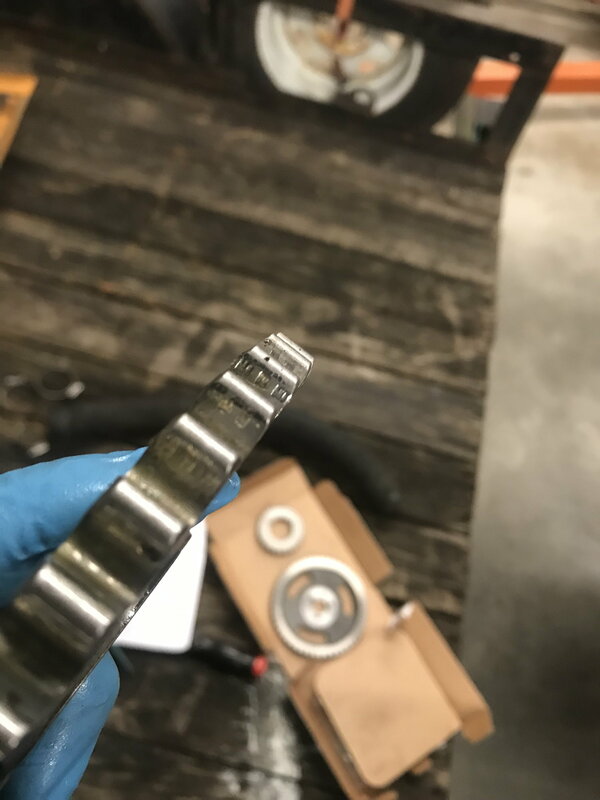 was the crank bore align honed? That wear was caused by the chain riding up on the gear. I would say that it would have blown within another 10 hours at the most. WOW - that was a close call. I did not build the engine, I don’t believe it was line honed but I don’t really know. It has stock main caps so I doubt it. I will find out when I install the new timing set. I dodged a bullet for sure, hopefully there aren’t any more surprises hiding from me. Line honing has nothing to do with what main caps you have. You cut some off the top of the caps and then re cut the holes by using a line hone. this causes the crank bores to be slightly closer to the cam bore causing slop in the timing chain. They make a chain that is shorter for blocks that have been line honed and need it. 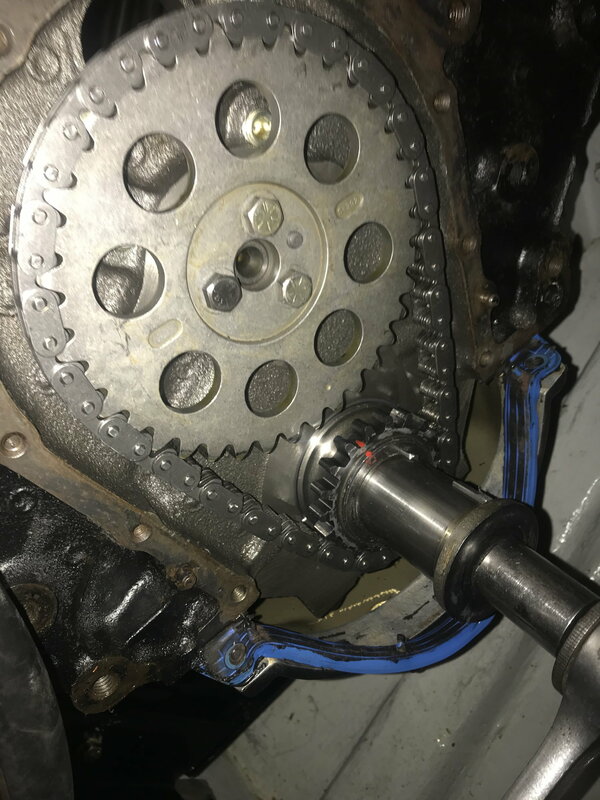 I would not be surprised when the past owner "rebuilt" the motor they left the gear on the crank. Either it was worn or not the same exact dimension as the replacement gear and it let the chain flop around. On any motor I open up I dump that single crap and put a double roller on it. Also there is metal missing and it went somewhere. Last edited by f_inscreenname; 02-07-2019 at 11:18 PM.